So what's 905 feet long, 181 years old, and weighs over 20 million pounds? No, it's not the New York Yankees team airplane, but that's not a bad guess. What if I told you it was "falling down, falling down"? That's right, the London Bridge. Now to be clear there are currently two London Bridges: one in London (of course), and one in Lake Havasu City, AZ. I am writing to you today about the latter, and how it came to be in the middle of the Arizona desert. But to back things up a bit, a little history is in order. There has been a bridge over the River Thames called the London Bridge since as far back as Roman times, more than 2000 years ago. The one from the famous nursery rhyme was built around 1136, and was more or less an extension of London. It spanned the river with a series of arches like any other bridge of the time. But it also had numerous tall buildings atop it that housed businesses, shops, a cathedral, apartments, and more. And from the years 1305 to 1660, was home to one of the most gruesome displays in history. Starting with William Wallace (Braveheart), severed heads were placed on metal pikes, dipped in tar (to protect them against the elements), and displayed on the southern end of the bridge. At one point, there were as many as 30 severed heads greeting visitors as they entered via the bridge. I think it's safe to say that tourism wasn't on the minds of the city fathers of that time. Anyway, the thing was indeed falling down by the beginning of the 19th century, and was replaced in 1831 by a five-arched, granite structure designed by John Rennie. It was considered quite an engineering accomplishment at the time, and if nothing else, had no human heads mounted on it. However it was never designed to hold automobiles, and by the middle of the 20th century it had begun to sink at a rate of about an inch every 8-10 years. They did the math on that, and in 1967 the decision was made to replace the bridge. But rather than demolish it, city council member Ivan Luckin suggested that they first try to sell it. But who in the world would buy a bridge, sinking or otherwise, and what would they do with it? Enter Robert McCulloch. He - of McCulloch chainsaw fame - had recently embarked on an ambitious planned community on the shores of Lake Havasu. In the middle-of-nowhere Arizona, the land was a defunct airstrip used by the U.S. military in WWII. It was given to him by the the state of Arizona in exchange for the promise that he develop it. But try as he might, he couldn't convince many people to even visit the area, let alone buy a retirement home there. A real estate agent working for McCulloch named Robert Plumer heard of the London Bridge sale, and suggested that this might be just what the floundering project needed: a major tourist attraction. McCulloch at first thought he was crazy, but then came around to the idea. He ended up placing the winning bid of $2.46 million. He said that he came up with the price by doubling the cost of dismantling the bridge ($1.2 million) and adding $60,000 ($1,000 for each of his years at the time). There is a fair amount of evidence to suggest that he had little, if any, real competition for the bridge, and he may have substantially over paid for it. But that's what happens when you buy a bridge, I suppose. Regardless, the sections of the bridge were meticulously numbered, disassembled, and shipped to California via the Panama Canal, and taken over land by truck to McCulloch's Havasu City development. It was painstakingly reconstructed (with the addition of steel-reinforced concrete), and completed in October of 1971. Now what are the chances that you could buy a bridge and have a span exactly that size somewhere else to place it upon? Probably zero, which was the case here. In fact, McCulloch didn't even have a river to place it over. Instead, he had his team rebuild it over dry land. He then diverted water from Lake Havasu via a new canal he called the Bridgewater Channel, and bingo! You've got yourself a river. And can you guess what happened next? That's right people started coming to see the London Bridge. Now there are some popular rumors that many people thought they were going to see the more famous (and recognizable) Tower Bridge of London. There is even a urban legend that this is the bridge McCulloch thought he had bought, until it arrived on U.S. shores. But that's all a bunch of baloney. He knew exactly what he was buying, even if he did over pay for it, and knew how to market it. Today the city has over 50,000 residents and draws over 750,000 visitors annually. All because of a bridge and a nursery rhyme. And a ton of cash, of course. Lake Havasu City is also home to some great timeshares, and I am staying at none other than the London Bridge Resort. It's the only only waterfront, all-suite condominium resort in the city and offers golf, tennis, three swimming pools, a spa, several dining options, convention facilities, wedding pavilion, boat slips and much more. RedWeek members rate it 4.5 stars, and there are both rentals and resales available. Well I am off to take a walking tour of the famous bridge, which lasts about 45-minutes. But I gotta tell you, I just can't shake the thought of those heads mounted on the old bridge. And I am in no way suggesting we return to that type of barbarism. 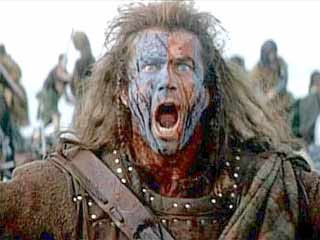 I am simply saying that *IF* we did, wouldn't it only be fitting - in the absence of the real Braveheart - if we started with the Hollywood version of the Scottish warrior? I know, I know. That was offside, and is going to get me some hate mail. Hopefully they are not accompanied by any late night, profanity-laden voice messages from you-know-who.